Victoria Beckham is famous not just for her Spice Girl years, but for her svelte figure and super healthy diet. And now it seems her kids are following in her nutrition-conscious footsteps, because the mum-of-four has revealed the snack she feeds her family after school, and it’s certainly not a bag of Hula Hoops or cheeky cereal bar chucked into the backseat of the car mid-school run. From the look of a behind-the-scenes photo on social media Brooklyn, 18, Romeo, 15, Cruz, 12 and six-year-old Harper tuck into post-school snacks of mixed seeds doused in organic aminos – a gluten-free replacement for soy sauce. 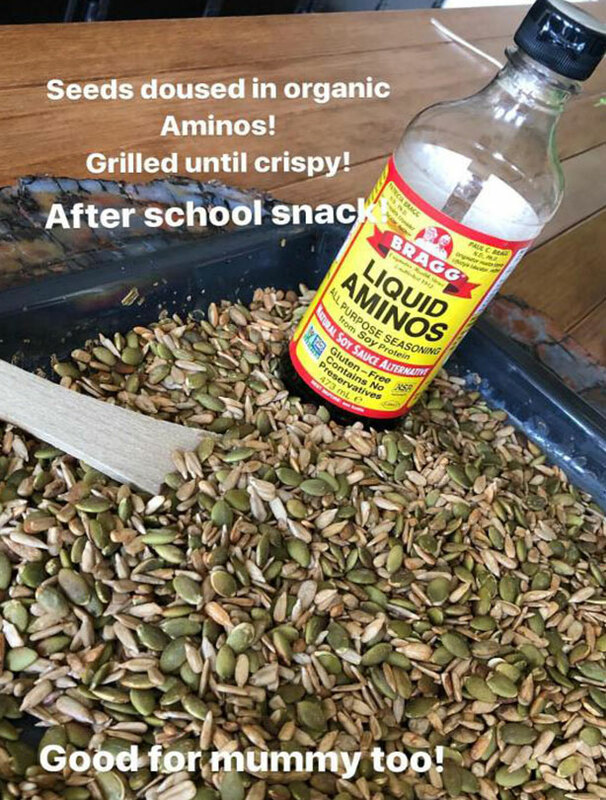 The 43-year-old former Spice Girl shared a candid snap with her 17.2m followers of what looked like a tray of mixed nuts of pumpkin seeds and pine nuts, with a bottle of Liquid Aminos on the side. Victoria – who has been married to husband David since July 1999 – has long been a fan of aminos; in a 2014 interview she revealed she takes a staggering 60 vitamins and supplements a day. “Twenty-two amino acids, 12 vitamins, 28 minerals,” she told Vogue of her daily routine.